Crusaders battled back from 2-0 down to secure a point against Ards. Pic by Pacemaker. Ards manager Warren Feeney was pleased with a point on Saturday - despite that fact his side led Crusaders 2-0 with 25 minutes left to play. Goals from Michael Kelly and Craig McClean gave Ards a 2-0 lead, before late strikes from Declan Caddell and Ronan Hale cost the win. Ards are now two points clear of basement side Newry City, with two games left to play. “If you had offered me a point against the champions before kick-off, I’d have been over the moon with that,” said Feeney. “However, the boys are gutted in there, I think that says a lot. “They’re disappointed with a draw against the champions. “They have the right mentality. “The frustrating thing is we got ourselves in a fantastic position to win the game, but Crusaders brought quality off the bench in David Cushley. “They have so much strength and depth. “To dig in and get a point is impressive, you can’t fault their effort. “Even against Warrenpoint last week, when they were poor, there was no shortage of effort. “They’re desperate to stay in this league. “It was tough as Crusaders were throwing everything at us. “On another day, I might have brought on another defender but, with Damien McNulty and Michael Kerr missing, we didn’t have defender on the bench. Northern Ireland internationals Stuart Dallas and Gavin Whyte cheered on their old team from the stands at the Bangor Fuels Arena. 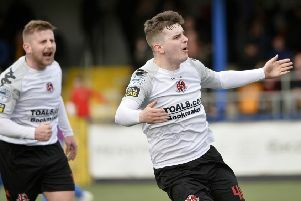 The players’ former Crues boss, Stephen Baxter, had no regrets about resting several key players with one eye on this weekend’s Tennent’s Irish Cup semi-final against Coleraine at The Oval. “We have a number of knocks and a few players one yellow card shy of a suspension, so it made sense to protect those players against Ards,” said Baxter. 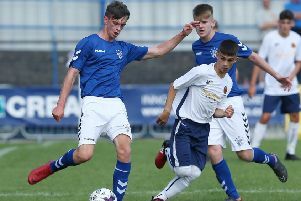 “For example, if Billy Joe Burns picked up a yellow against Ards he would have missed the Coleraine match, which is obviously huge for the club. “I’ve no regrets about making those decisions because we had enough quality on the pitch to win that game and we really should have won it when you look at the chances we missed and the balance of play. “We were by far the better team on the day. “We started really well and forced Sam Johnston into some good saves. “Ards scored the first time the really got up the field, after Mark McChrystal made a mistake. “At 1-0 down, we stopped passing the ball and the game became scrappy. “It was a great free-kick from Craig McClean, but it was strange to find ourselves 2-0 down even though Ards hadn’t done a lot. “It was an interesting position to find ourselves in. “We made a few changes and put Ards under a lot of pressure.